NRG came home without the win on 11th February, from their very exciting first bout of 2012 against Nottingham’s Hellfire Harlots. 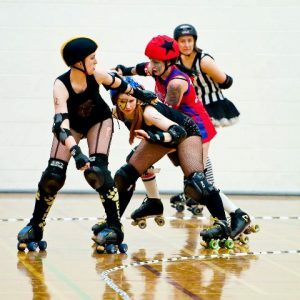 After closing the points differential to within 15 at the start of the second half, a lot of official time outs and successive lead jammer calls to the Harlots meant that Newcastle lost 162-95. And even this super amazing video too, all by Graeme Wharton! Previous PostJanaury blues? Have a discounted shirt on us to ease the painNext Post29th February NRG Expo Night – We Want You, Yes You! !